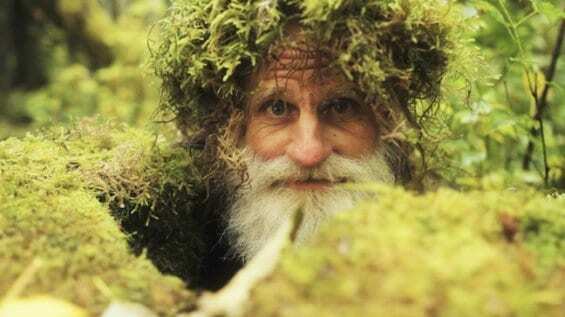 Although he is known all around the world, Mick Dodge is usually called the Barefoot Nomad or the Barefoot Sensei. 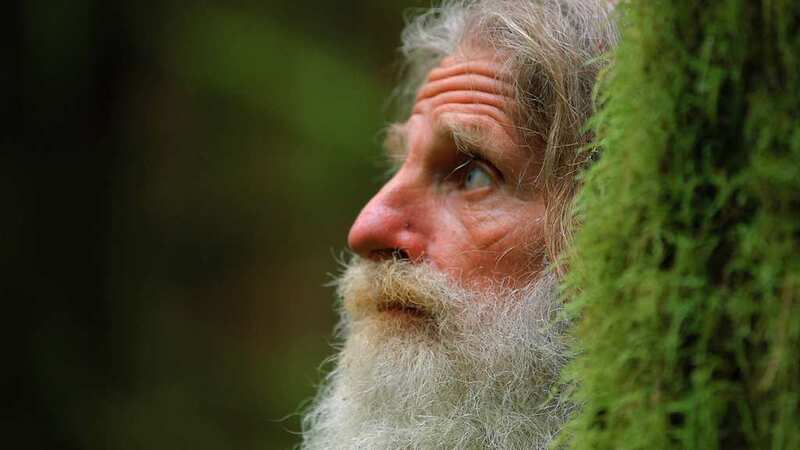 Following his heart, Mick decided to leave the modern world in 1991 and he’s been living as a wanderer in the Olympic mountains, based in the Olympic peninsula of western Washington. Over twenty-five years, he developed his unique techniques and tactics for surviving on the outskirts of western civilization. Born to a family of travelers and explorers of Scottish-Irish descent, Mick lived all across the United the states and the world due to his father’s occupation and absorbed many different cultures. After finishing his military service in the marines, Mick had a regular job as a mechanic in Fort Lewis before deciding to retreat back to the wilderness in order to to get back in touch with nature. Whereas the most of us cannot escape the loop of this modern day and age, Dodge chose a different story for himself. 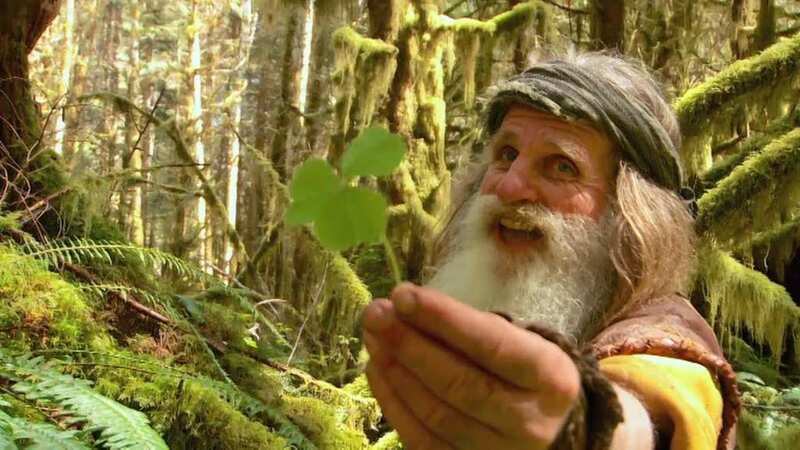 While we work a nine-to-five job in a fluorescent-led cubicles and thinking about a corporate future, Mick Dodge chose to return to simplicity – to walk barefoot in the woods, gather berries, hunt birds and start a fire while sleeping in a nearby cave. His point of view and teachings often mix Japanese warrior techniques, natural philosophy, human instincts, and survivalism. Dodge consider himself a pacifist but also relates to the hunting sense that resides in every human being. 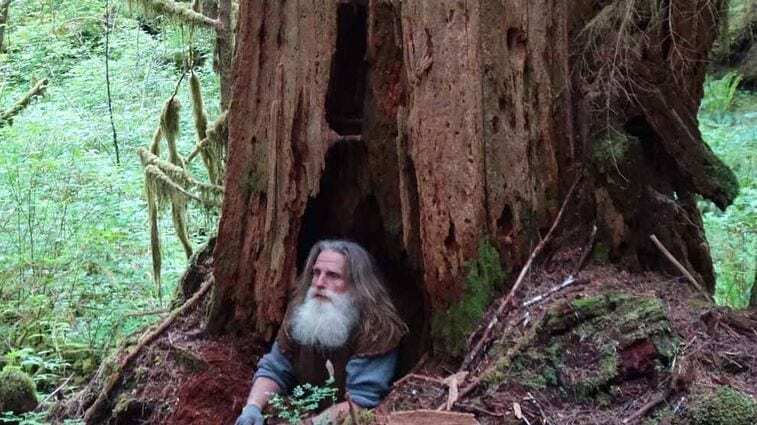 While remaining off the grid and unknown to the rest of the world for many years, he is very famous nowadays due to his hit reality series on the National Geographic channel called The Legend of Mick Dodge. The show documents Dodge’s everyday life with his experiences and challenges, while involving other elements of storytelling. 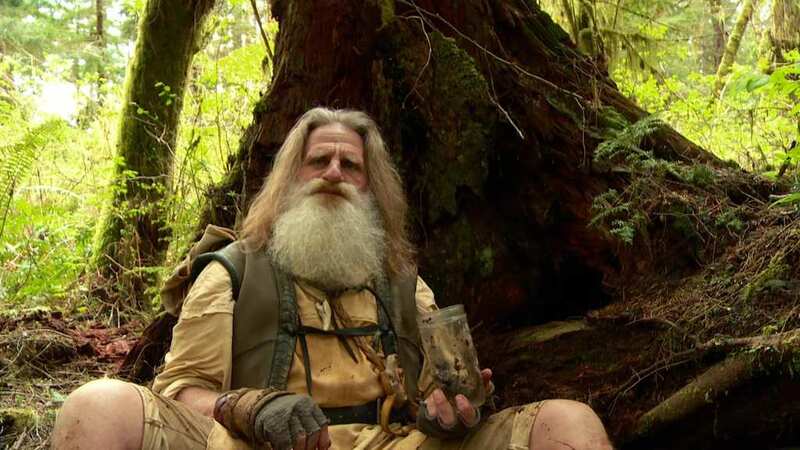 Here are some of the insights on the story of the unbelievable Mick Dodge. When it comes to forest food, Mick has a few interesting options. He likes to drink home-made olive oil right of the bottle and claims that it is extremely healthy and strengthen the joints. He also carries a jar that contains testicles of an elk, which he considers as an ambrosia. 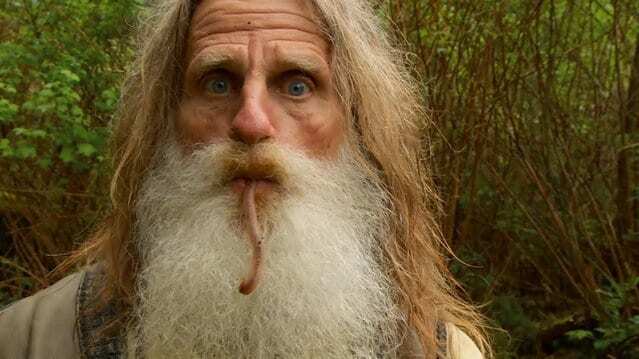 Besides all that, Mike also like to eat various worms that he finds while wandering in the forest. He carries a large wooden stick that helps him to stun the worms before eating them. Mike also speaks about the hunting sense that all humans possess. He recalls his hunting experience with his granddads, in which they would scout in the woods after fasting the day before. In his words, all of them were in kind of a “hunter mode” due to their hunger and they could find tracks more easily. After conversing with yoga practitioners, Dodge found a similar connection, as they fast regularly in order to improve their senses. His explanation to that condition is due to the human race being originally a hunter-gatherer. As a result, their body mechanism is built to highlight their senses when food and energy are needed. Regarding the use of stealth in the woods, Mick said that it’s crucial to fit into the rhythm and silence of the forest. It requires intensive training in order to move and to become as one with the woods and the mountains while getting rid of your own ego. A survivor must learn all the skills in order to develop that ability. He also speaks about stealth as moving softly and decreasing the traveler’s noise, which can prevent damage to him from other animals. Mick discusses the idea of the Yamabushi, which means in Japanese “to become one with the forest”. The Yamabushi are an order of Japanese mystic hermits that live in the mountains and have been told to have supernatural powers. They inspire him, and Dodge’s goal is to be exactly like them. Mick also explains that it may take a long time for an urban person to get accustomed to such a different environment as the woods. One of the major foundations of the human race is the passing of knowledge and teachings from one to another. Mike himself says that in addition to passing knowledge through words and books, one can also pass his teachings through movement. 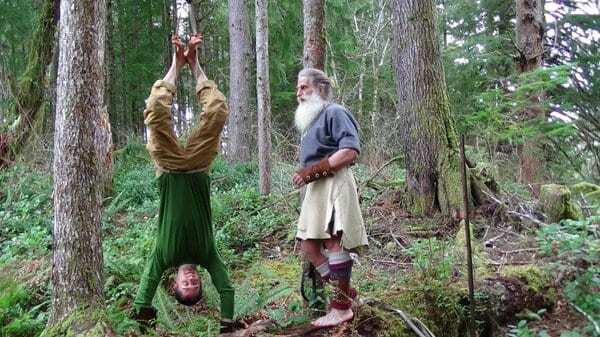 He teaches others how to travel in the forests and improving their skills. Regarding his attributes, he counts his father, uncles, and grandparents as mentors in his life while also including nature’s elements as well such as the trees and the water. One of Mike’s interesting thoughts is the philosophical idea of a present. According to him, one needs to differentiate between a present (a gift), present (the verb, to present) and present as a tense. He often talks about gifting to each other; the gift is a present to another in order to present yourself. In his belief, everyone in the world has a special quality they could present, a story to tell. This gift keeps them in the present, meaning in that exact moment. Before he embarks a journey in the wild for a few days, Mike will have to prepare food for the mission, using only the basic ingredients. He will then make bread for his travels, using an old baking method that dates back to the American Civil War and the nation’s pioneers. Mike puts a flour in a pot and adds a little honey. 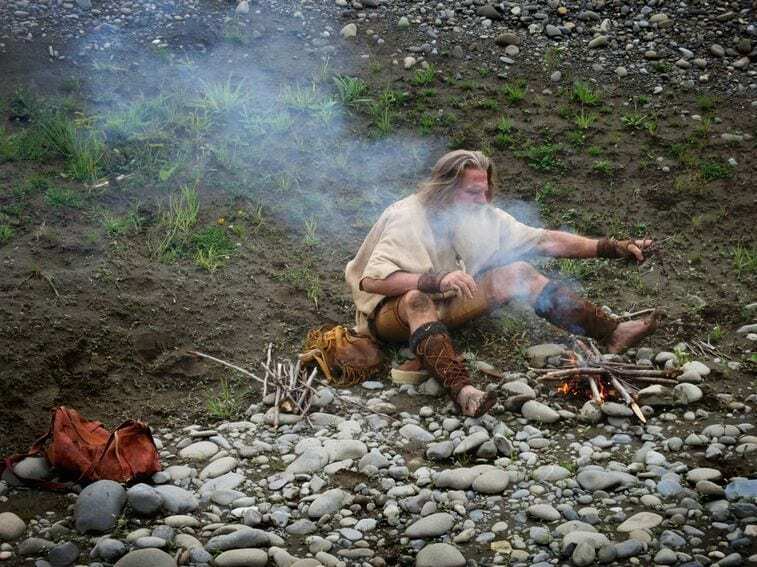 He then digs a hole and buries the pot inside, while in the meantime starting a small fire. He will then use the coal and ash from the fire to cover the buried pot on the ground. One hour later, Dodge has a home-made baked bread for his travels. 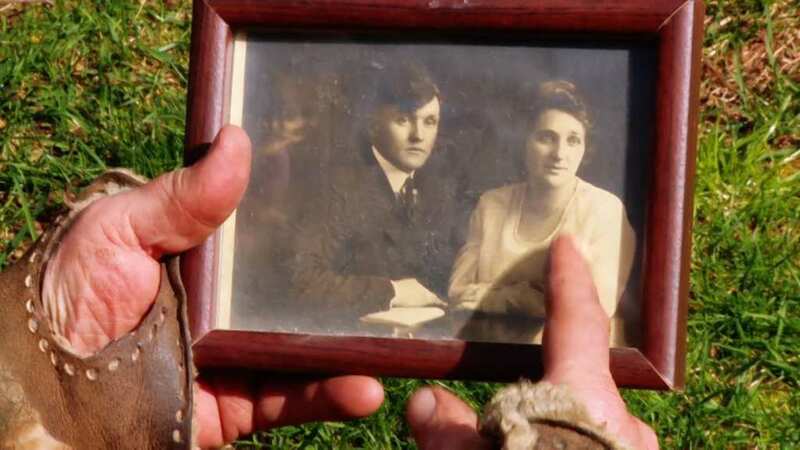 After a visit from Mike’s nephew from Idaho, the man from the wilderness revealed some his family’s past. For four generations, the Dodge family, originally from Scottish-Irish ancestry, lived in the Olympic Mountains which are based in the Olympic Peninsula of western Washington. His grandfather’s motto was that every day is a new adventure and he followed that code extensively. Along with all his adventures, he was also keen to teach his grandson how to live in the wild and to follow his primal instincts. The term Yoish is a word that Mick uses frequently throughout his day. According to him, he has learned the word from his sensei back when he was studying in Okinawa. Basically, this term has many meanings but Mick’s usually uses it in order to help him focus. He could say it when he lifts up an object and he wishes to focus his effort and attention, but also when he needs things to settle down and go back into place. 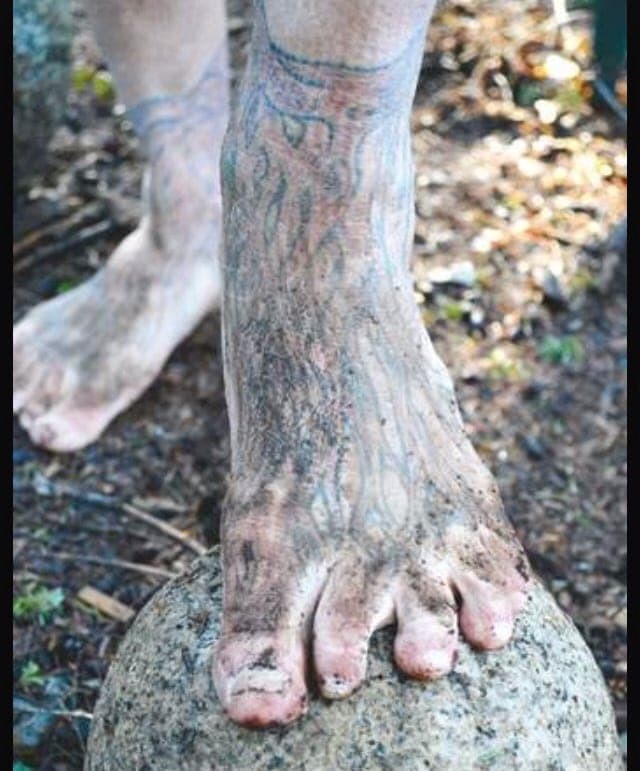 According to Dodge, he has been walking barefoot in the woods since 1991. He pointed that his ongoing feet problem was one of the main reasons he chose to live in the wild, claiming that it helped him cure his plantar fasciitis, an ongoing back pain, and his hammer toes. Dodge has also founded a community project called EarthGym. EarthGym is a fitness program in which nature provides most of the terrains for psychical training. Although he spends most of his time in entire solitude, Dodge considers his close friends and family as one of the important things to him in life. After Mick received an invitation from his best friend to attend his daughter’s wedding, he decides to attend the special event at any cost. However, it requires Mick to pack his belongings, leave camp and walk barefoot almost four weeks to the wedding which will take place in Northern California. When Mick wants to enjoy a nice hot-tub like in the modern world he just builds one. First, he must dig a very large hole that will be big enough to fit him inside. afterward, he will line a waterproof insulated tarp inside the hole. Then, he must improvise a heating system for the hot-tub, so he usually uses a car battery and propane-fueled water heater. After filling gallons of water to the hole from the nearby river, Mick will use a pump for the water to pass through the heater, thus creating hot water inside their improvised tub. Hunting birds in the forest is a good training exercise for Mick’s skills. 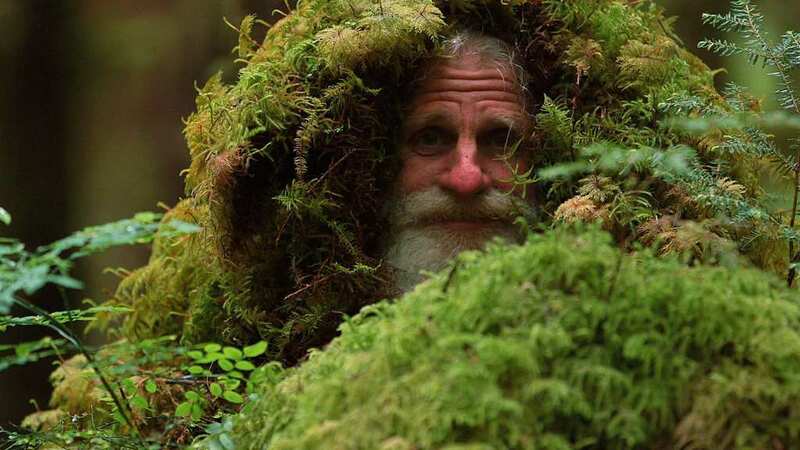 He will use a special suit made out of leaves to disguise himself in the woods and will wander for hours in the wilderness, scouting for his prey. He performs his technique of walking slowly in order to avoid noise and searches the trees for his next meal. Upon recognizing his prey resting on one of the trees, Mick will slowly aim his bow to hunt down the bird. However, the strike must be blunt so the bird won’t be dissolved from the attack. Forest stew is a perfect, healthy meal while living in the forest. Due to the fact that the wilderness may be lacking some ingredients, he must use whatever he can find. Mick will use stones in the stew, as their minerals will dissolve into the dish upon heating. A special treat in the stew are the various kinds of mushrooms that are in the forest, especially Boletes which are known to be very tasty. The last ingredients will be usually alga from the river that are delicious regardless of their look. 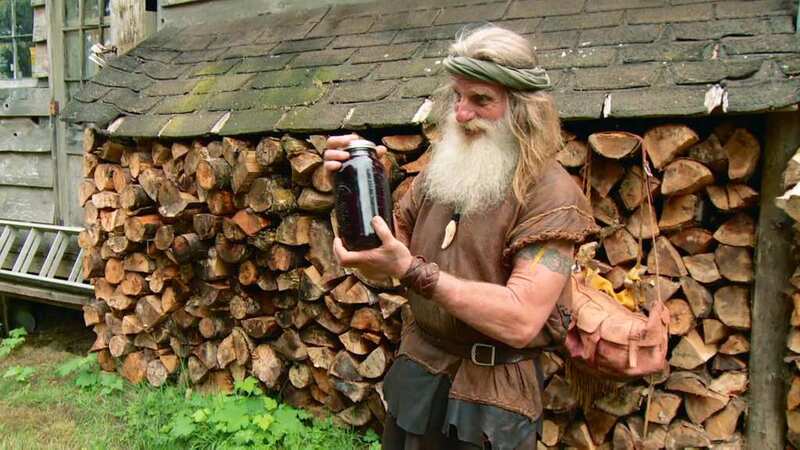 As summer arrives at Washington’s Olympic forest, berry season begins and Mick has a burning desire to brew a favorite drink he calls ‘forest wine’. He uses his ‘berry picker’, a special tool he invented, in order to harvest berries before it will be consumed by other animals in the woods. 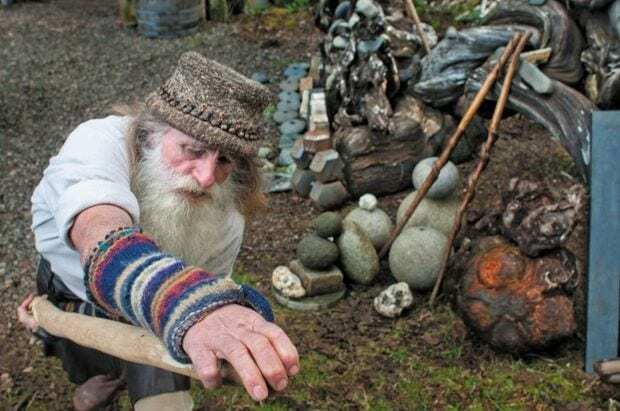 He collects blackberries, salmonberries, and salal leaves, then he mixes them with fresh water from a natural spring in the forest. The final procedure is to heat the mixture and to funnel it. The elixir will be ready in a few months. The barefoot wanderer slowly examines the countless trees and caves in the forest, while creating a strong bond with nature. He claims that the longer the traveler is away from the city and its distractions, the faster he could train himself to focus and to meditate. He also says that he would often daydream while wandering in the forest, an action that almost impossible to perform in the city due to its constant, loud noise. After finishing his studies, Mick decided to join the military and he served in the marine corps for almost six years. Afterward, he worked in a nine-to-five job as a mechanic in Fort Lewis. Through his life, the skilled survivalists also became a trained warrior who is familiar in multiple martial arts. These days, he thinks of himself as a pacifist and a philosopher. Although he is still a hunter, Mick will usually live in peace with the other animals in the woods. 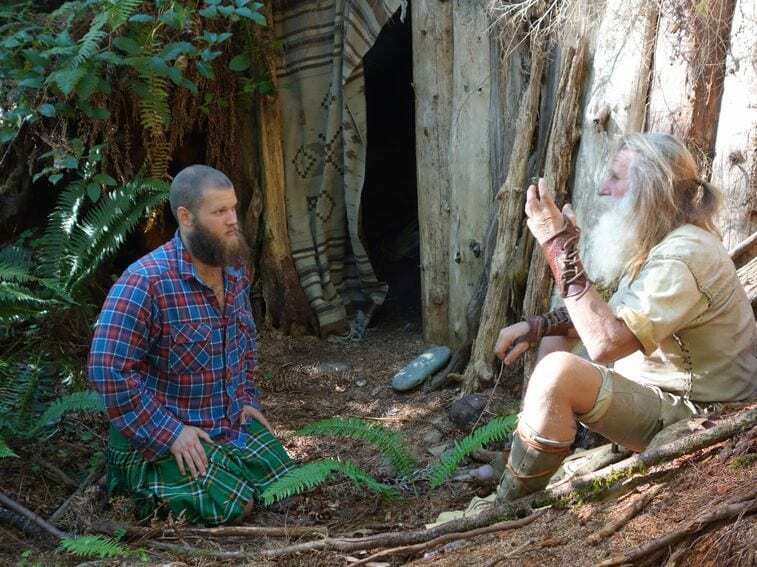 While he finds it hard to define his lifestyle, Mick consider himself as a mixture of many traditions – He is a warrior, a survivalist and a philosopher. For the past several years, Dodge traveled through the Pacific and became known as the ‘Barefoot Sensei’, due to his teaching skills as also his habit to walk without shoes. According to him, he only follows his family tradition of living close to nature while residing in caves and trees as shelters. 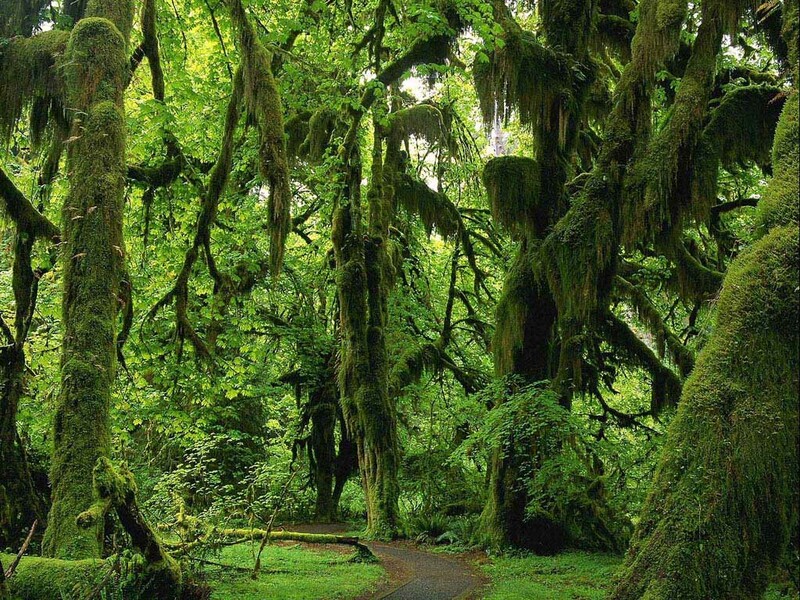 The state of Washington is known for its heavy rainfalls, which results in many debris swept from towns and cities all around into the river of the Hoh Rainforest. This situation is ideal for Mick, who uses the storm for his benefit. After it finally resides, he would go to his secret spot – a curve in the river where many discarded items are left there from the storm. Dodge would gather these items and will trade them in the nearby town for goods or money. Mick said that he loved wandering in the outdoors of the Pacific Northwest ever since he was a little boy. 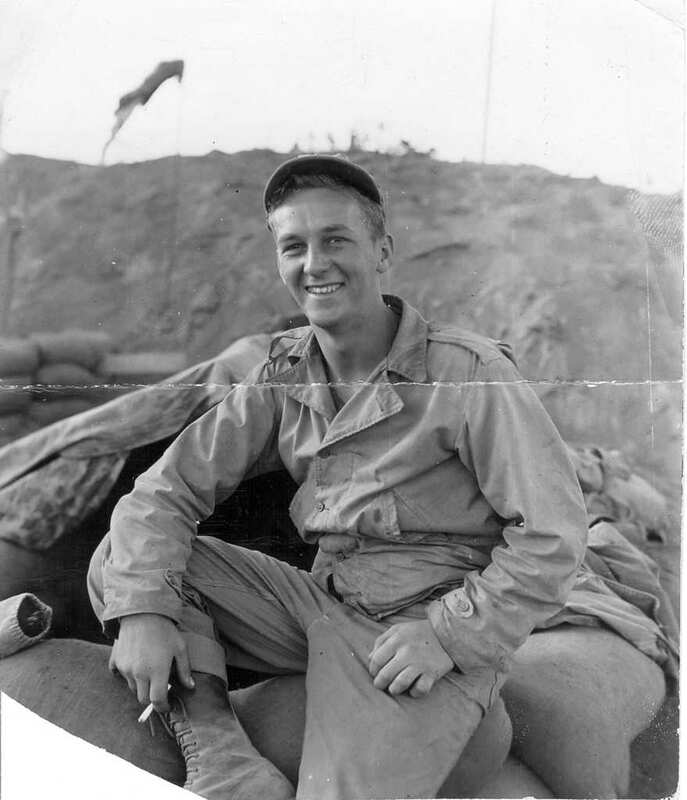 Dodge also explored different places in the country and around the world as his father, Ronald L. Dodge, was a career Marine who traveled all around the globe as part of his job. 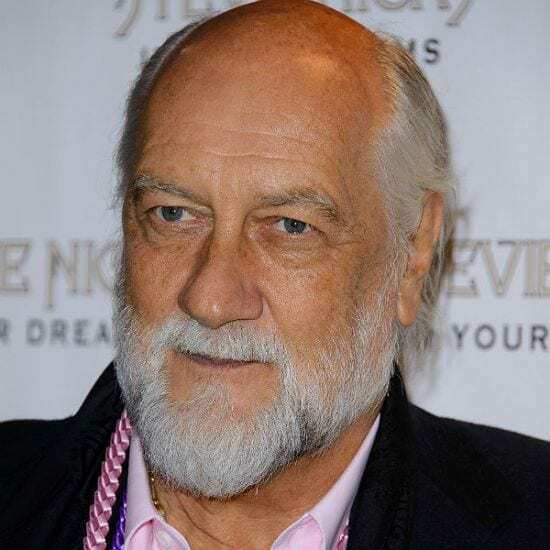 Mick eventually graduated from school based in Okinawa, Japan while adopting many Buddhist principles into what will become his nomadic way of life. Dodge constantly claims that he does not use any kind of currency in his everyday life. While it is true that he does not have a bank account, debit card or even a checkbook, Dodge does get paid by the National Geographic channel for his reality show. His salary is transferred to a community called the Olympic Mountain Earth Wisdom Circle, which Dodge is a part of. According to various reports, Dodge’s net worth is around $150 thousand. That’s a hefty sum of money for a wanderer. Many viewers began questioning the authenticity of the show and especially Dodge’s nomadic life. They also implied that the wanderer does not actually spend all his time in the forest. Mick himself said on the show that he stays with a lady friend of his during the cold Washington winter. He also leaves the forest occasionally to perform Skype calls for the show’s publicity while eating modern food such as cookies and Hamburgers. 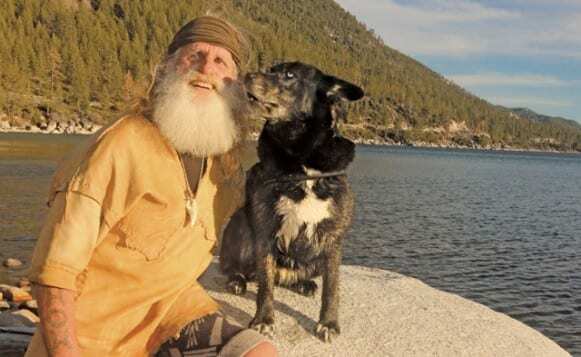 Dodge eventually responded that while he is not a %100 survivor, he does try to reconnect with nature to the publicize this way of life.